Ever worry about your cell phone dying when you don't have access to electricity? Whether you're backpacking, sailing, or in an emergency, the Unite to Light Solar Charger & Battery Bank will ensure that your mobile power needs are met at all times. All you need is the sun. - Outdoor portable 8000 mAh lithium polymer battery pack with 3.75 watt, super efficient solar panels. - Charges your cell phone three to four times with a full charge. - Dual USB Output 2.1A: Allows you to charge two devices at once. Compatible with all phones, tablets, and other small electronics. - Solar Rechargeable Battery or use the micro USB cable to charge in a standard outlet. Just like our lights, for every Solar Charger you purchase, we will donate one to a partner organization doing humanitarian work around the globe. For every Solar Charger we sell, we'll donate one to someone in need. Use the Buy button below and we'll send your Charger where it's most needed. You can also visit our Projects Page to learn about specific projects and partners and direct your donation through their individual page. 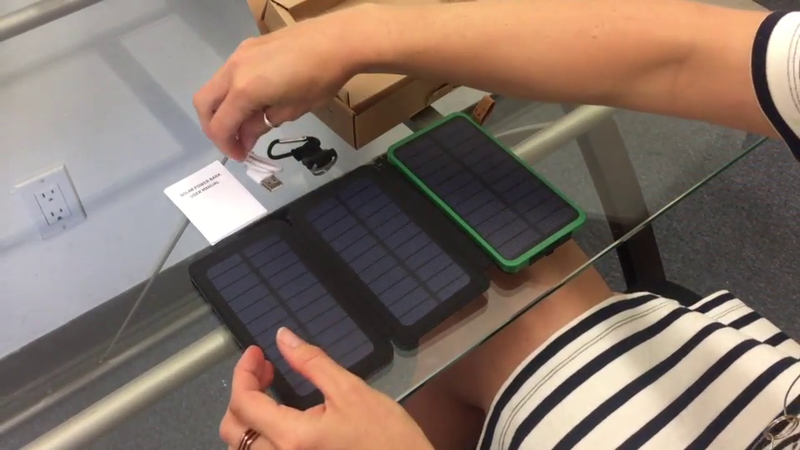 Do you have a charity of service project that where you'd like to provide our Solar Chargers? Any individual, charity, company or group may buy Chargers at cost as long as they will be delivered to those in need of power. Did you purchase a Solar Charger? Watch this short instructional video to learn how to charge it from the sun, or the micro USB port (cord included). Then use it to power all your devices or light your way at night!